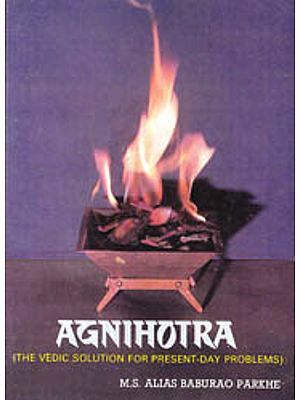 In all religions of the world which maintain sacrificial rituals and in which the portion offered to Gods is given to fire, that portion is normally offered raw except in Vedic India, where its previous cooking is necessary. The reasons for such a treatment forms the subject matter of this book. 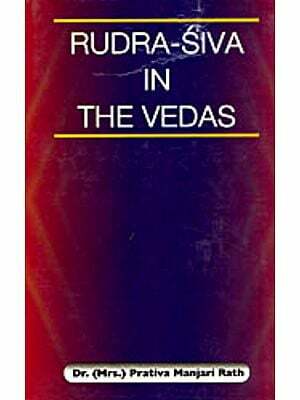 The author, through an exhaustive examination of Vedic, Brahmanic and Srauta Sutric texts, traces the beginning and development of the idea of cooking as transforming energy, from early Vedic hymns to the classical and fully complete sacrifices of the later Brahmanic times. 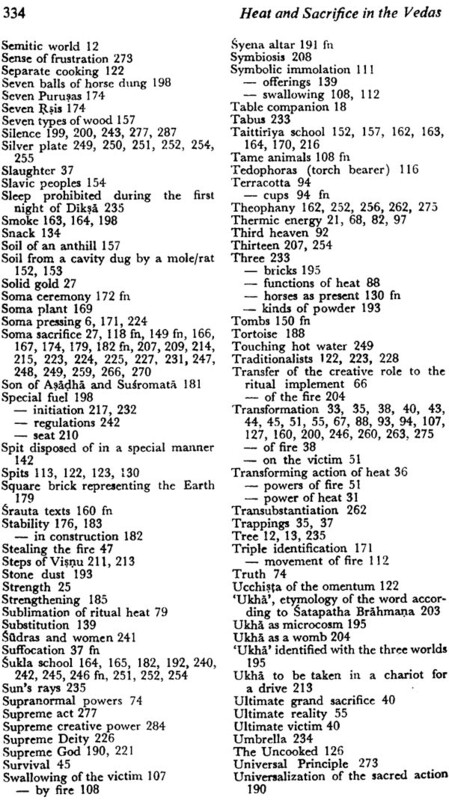 The work is divided into two major parts: The first, comprising four chapters, follows the emergence and development of the first intuition the rishis had of their use of fire as God of energy; the second part, consisting of the remaining four chapters takes into account four emblematic rituals where heat is especially prominent, discussing, how the presence of heat has worked in shaping those rituals and the spirituality that has arisen from them. 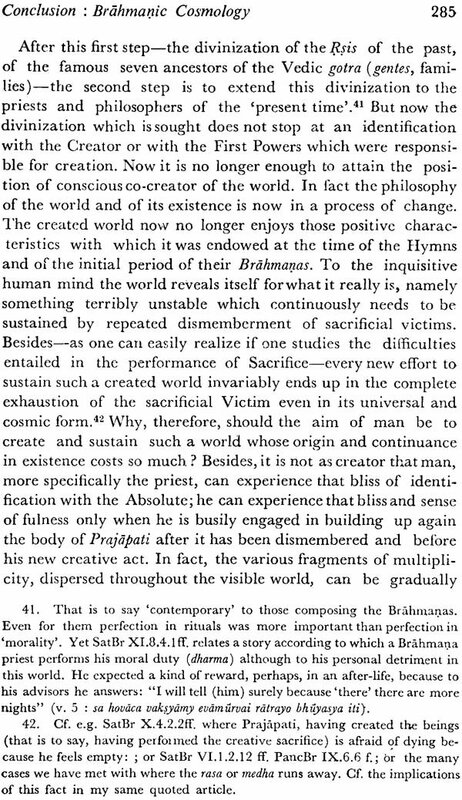 An introduction has cast the problem in its human, temporal and geographical conditions, while a conclusion has brought the entire matter to its heavenly accomplishment. Born in Roma (Italia), Uma Marina Vesci received her education in Roma itself, graduating in Ancient History and Archaeology with a thesis on: " the use of Musical Instruments in the religious Life of Ancient Greece". Further, she specialized in History of Religions with a thesis on: "God, Man and Salvation in the Spiritual change in the VI century B.C. from China to Greece". 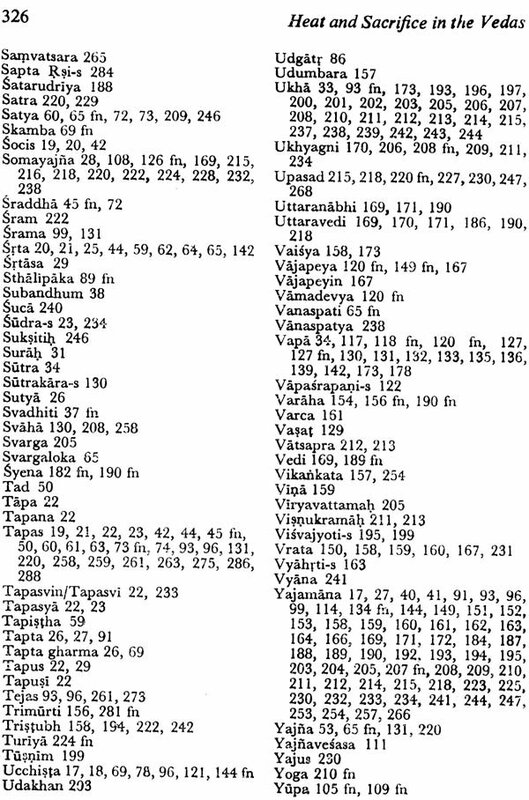 At the end of 1963 she won a scholarship to India where she continued her studies centered on Hinduism and especially on Vedic texts. Since then she has continuously lived in India to the present with support from various scholarships and fellowships in B.H.U. (Varanasi), Indian Institute of Advanced Study in Simla, at center of Advanced study in Philosophy, Visva Bharati(Shantiniketan), and in the Italian Embassy Cultural Centre in Delhi and Varanasi. In this last capacity she has taught comparative religions for a short while in Patiala at the Dept. of Religious Studies. 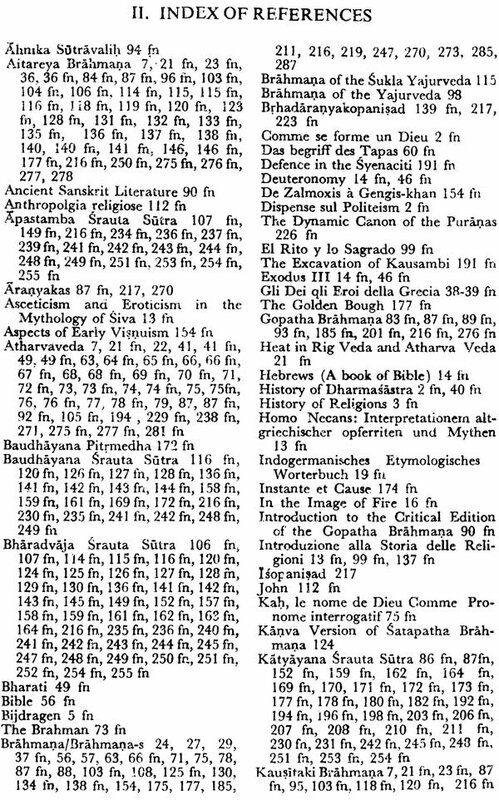 Dr. Vesci has contributed many articles on Indological subjects to numerous international journals and has lectured widely. Writing a foreword to an author's first book is, like the writing of the book itself, a kind of ritual. 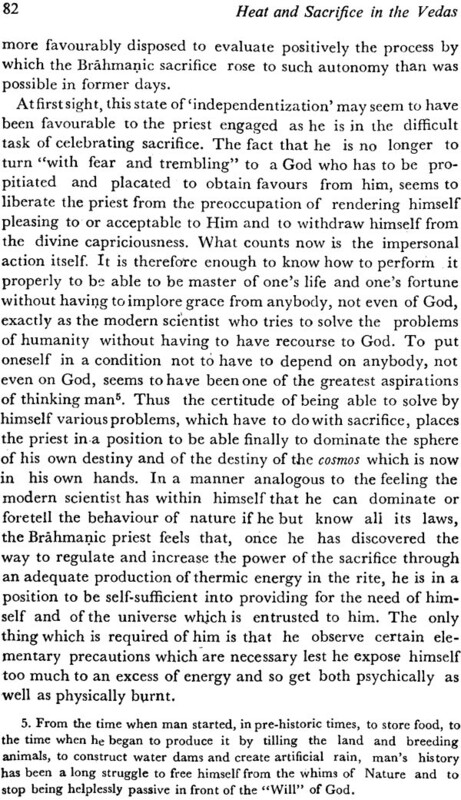 And this is all the more so if the work is the summing up of twenty years of study, and the one who introduces it has himself been deeply involved in the process. 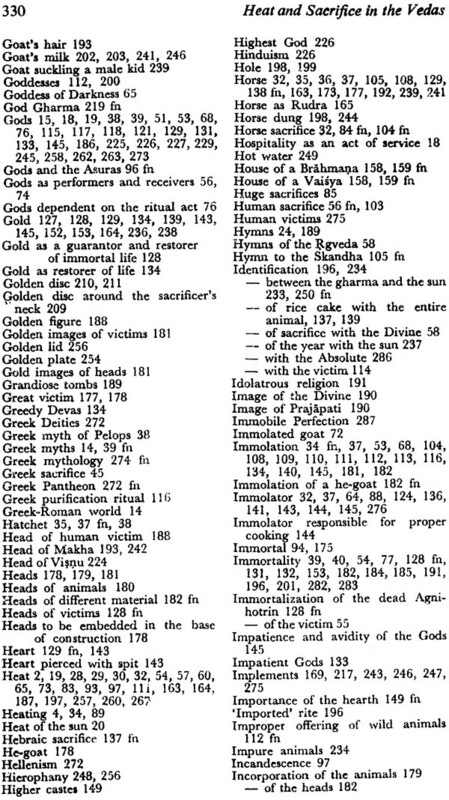 It forms part of the author's rite of passage into the realm of what the western medievals called by the solemn word 'auctores', because from then on they had 'auctoritas' i.e. the capacity to foster the intellectual and spiritual growth of the people. They were no longer interpreters of the past but shapers of the present and creators of the future. I gladly perform this ritual of presenting both the author and her work. And in fact, introductions are generally supposed to furnish that biographical background which is all too often as crucial to the deeper under- standing of a book as is the immediate context furnished by the writer. So, I propose to say, first, a few words about the author and, second, something about the work. In 1963, shortly after completing her studies at the University of Rome, Dr. Vesci left for India to begin a life that few scho- lars have the courage to undertake: to get lost in the new culture, to incarnate oneself in the other tradition, to live and share the destiny of the newly made friends, and to do this hav- ing cut the bridges of return. In a competitive society, even if it goes by the name of academia, an absence of decades will severely jeopardize any opportunity of being accepted back and integrated into 'business as usual'. In a modern, job-oriented civilization, negotium is the only thing that counts. 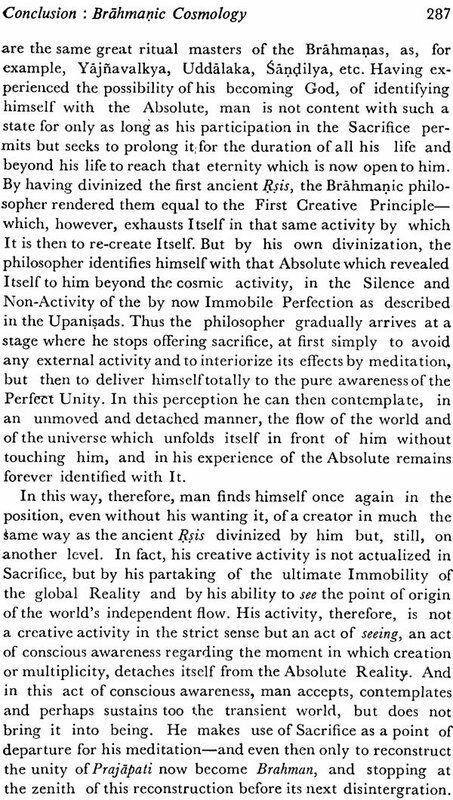 In India, Marina Vescienjoyed the creative otium which per- mitted her to practice the most natural and perfect way of 'knowing' another culture : to learn as the children of any cul- ture do, to sit at the feet of the masters, to assimilate as we do a healthy food without concerning oneself over producing immediate results and writing informative papers with hastily collected data; in a word, to incarnateoneselfin the other culture. Everything she has published so far has been truly assimilated and is as much a part of her praxis as her 'theoria'. 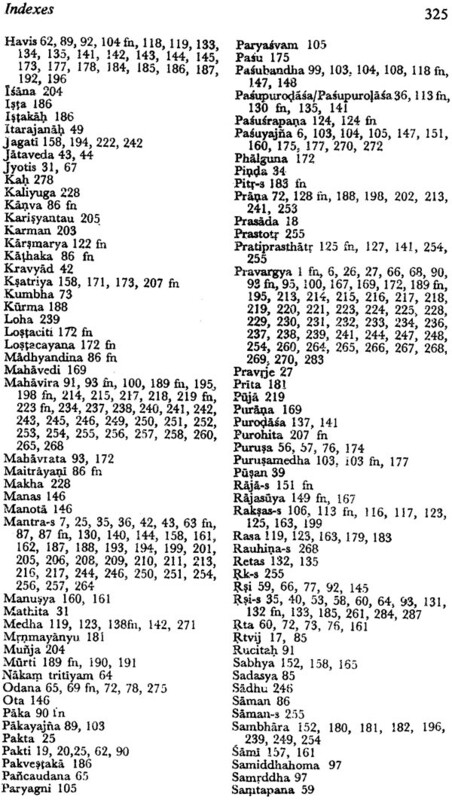 I know of her early sketches describing her first encounters with India and once even recommended that she not keep them to herself, but she considered these materials-and rightly so-as the soil out of which less anecdotal and more substantial studies would grow, as they have in course of time. Uma, as she later became known, began to delve deeply into the culture of the South, Bengal and the North: three different worlds. 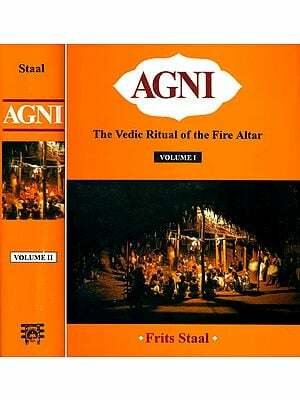 She soon discovered the underlying fabric of the entire Indian tradition: Vedic culture. 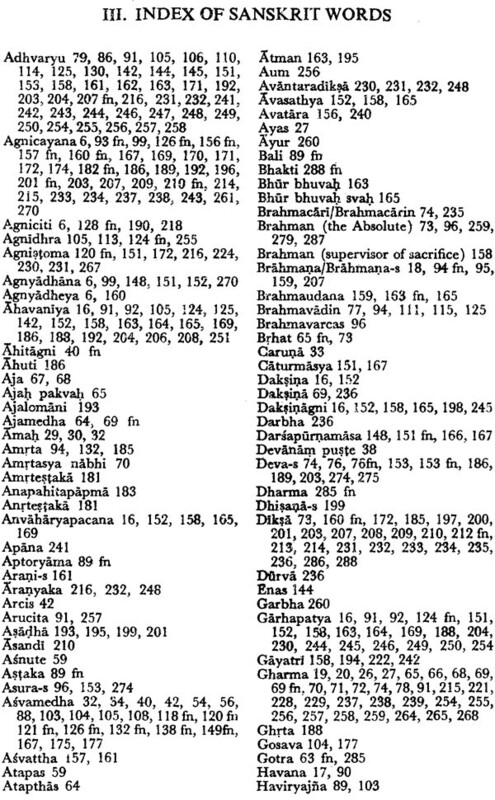 To be sure, it is not the only element that makes up the warp and woof of what we call the culture of the Indian subcontinent (we must also integrate the strands of pre-Aryan culture, the tribals, the later reforms and also the graftings, such as Islamic and Christian cultures and the secular world-view). 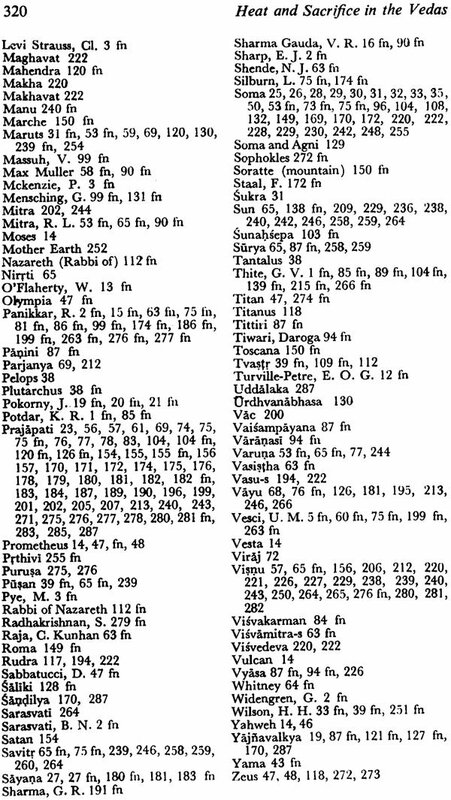 But there is no doubt that the lion's share is had by that extraordinary vision which crystallizes in the Vedic culture. 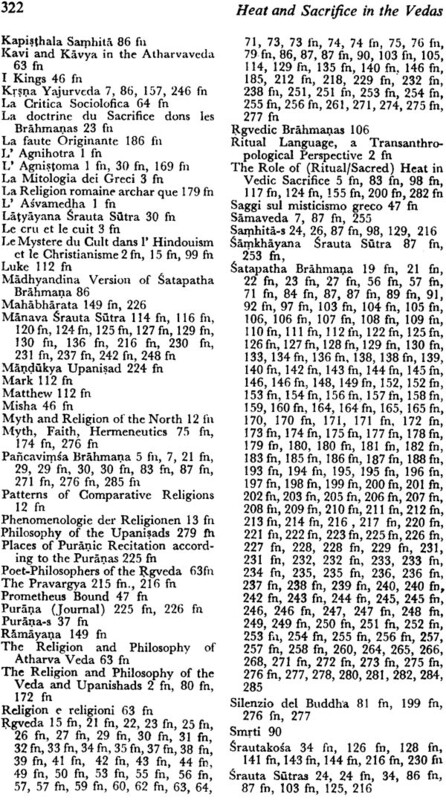 It is well known that western indology and also, by repercussion Indian scholarship, was, until very recently, mainly interested in the speculative aspects of that culture. 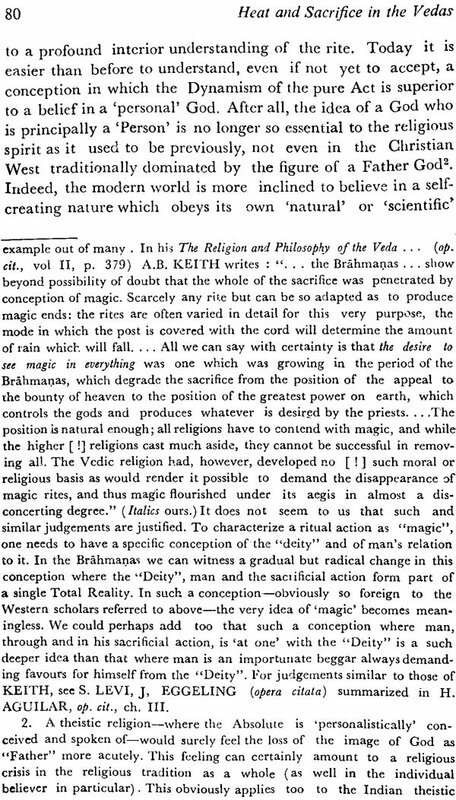 The rest was con- sidered 'primitive', if not outright superstition. Western scholars were by and large not interested in, and Indian pandits were almost ashamed of, the ritualistic literature. 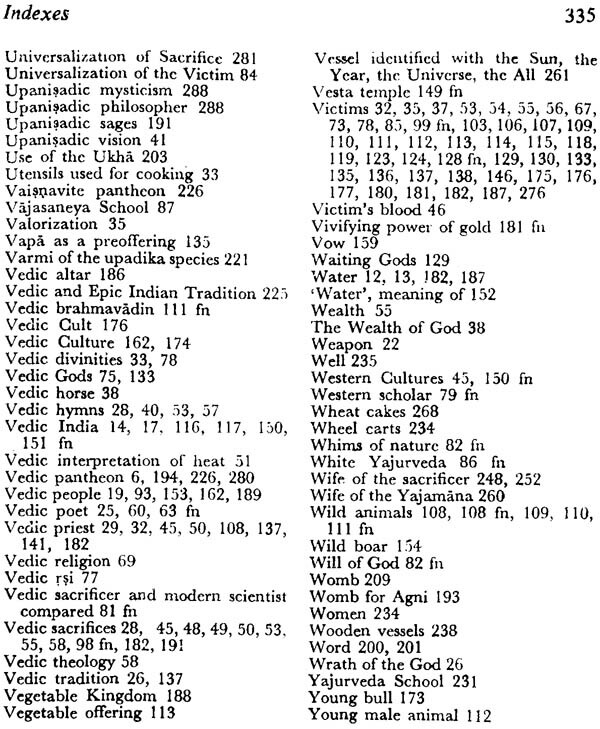 The Samhitas of the Vedas and especially the disquisitions of the Upanisads, so the discourse would go, are refined productions of the human mind, but most of the Brahmanas, and especially the rituals, were considered- 'galamatias' to say the least, when not just decadent casuistry and priestcraft. The Puranas, or ancient legends, have been over the last few years more and more investigated, but it is only very recently that students are beginning to take the rituals seriously. 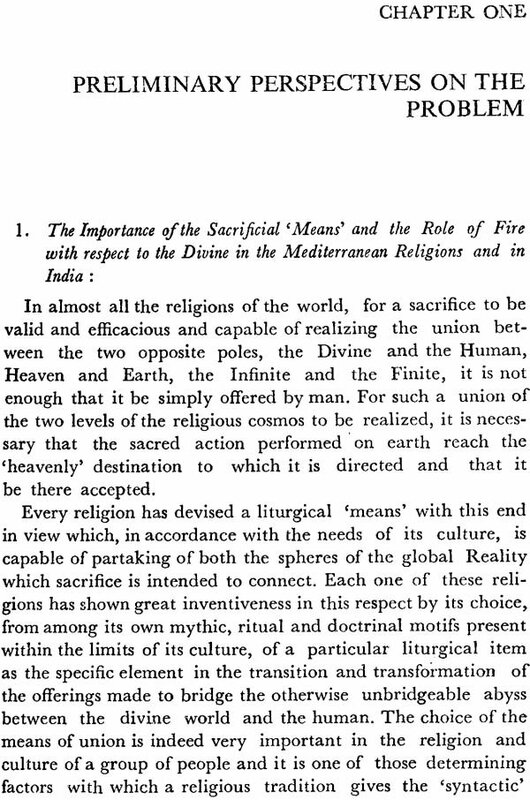 When Marina Vesci first started for India I recommended to her the topic of tapas (ardor, and thus heat, zeal, concentration, spiritual power), that extraordinary symbol which cuts across the ages and schools of India. It has an existential as well as a doctrinal character, a cosmic as well as an anthropological meaning, and is certainly a divine category. Uma has been studying and practicing tapas since then. Most of her published articles refer directly or indirectly to this topic, and this book, as well as a forthcoming one, started, as it were, by dealing with the problem of tapas even if the nature itself of tapas com- pelled her to shift her main subject toward the effects of heat ill sacrifice as such. 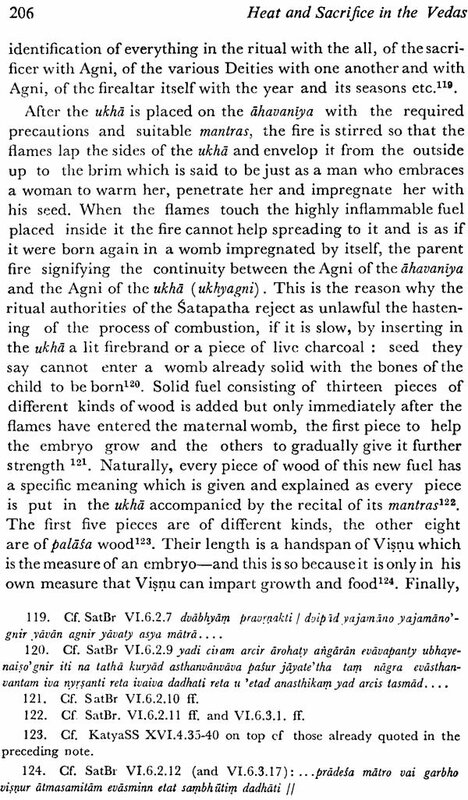 Actually tapas has, or better is, a ritual element, being intimately linked with Agni and thus with the sacrifice which constitutes the core of Vedic culture. 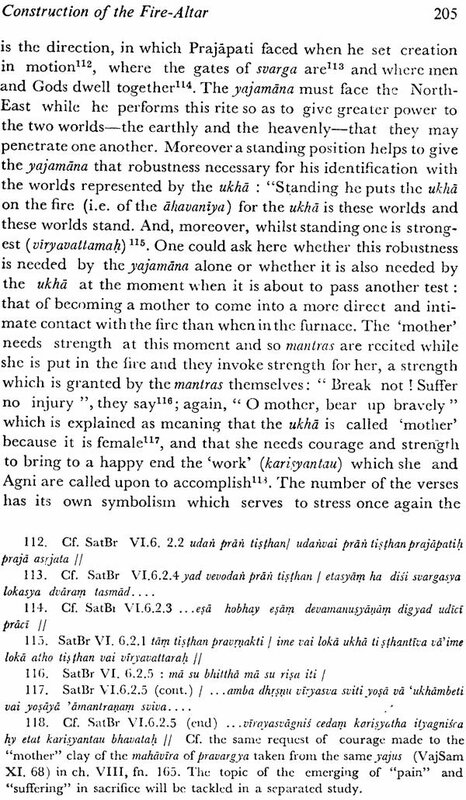 For this reason she preferred to turn her attention to the subject of rituals, and precisely to those rituals connected with cooking and heating. 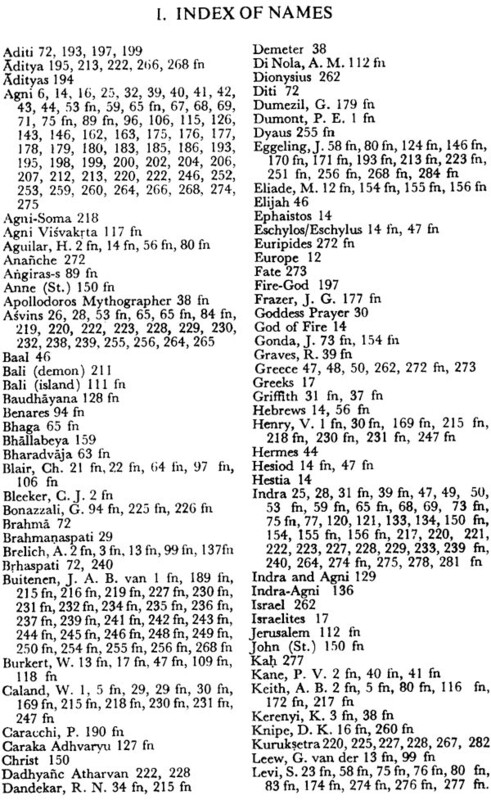 This has prompted the author, and this is one of the merits of this book, to unearth an entire world that only now is beginning to be rediscovered and appreciated by scholars in India and abroad. When she first began to express interest in the topic, she was often either misunderstood or discreetly advised to choose another subject of study. Moderns tend to forget that to 'study' (studium) means to turn one's whole being toward an aspect of reality, having sensed the urge to integrate it into our lives. Study, in this sense, is a passionate, all-consuming acti- vity not only of the mind, but also of the heart. It has an irreducible existential dimension. And so I have already begun to present the book to the reader. But before doing so directly, I wish to voice a certain concern, one that will be especially understandable to the reader who happens to live in modern India, or is aware of the present situation. Such reservations or misgivings may be expressed somewhat like this. 1. 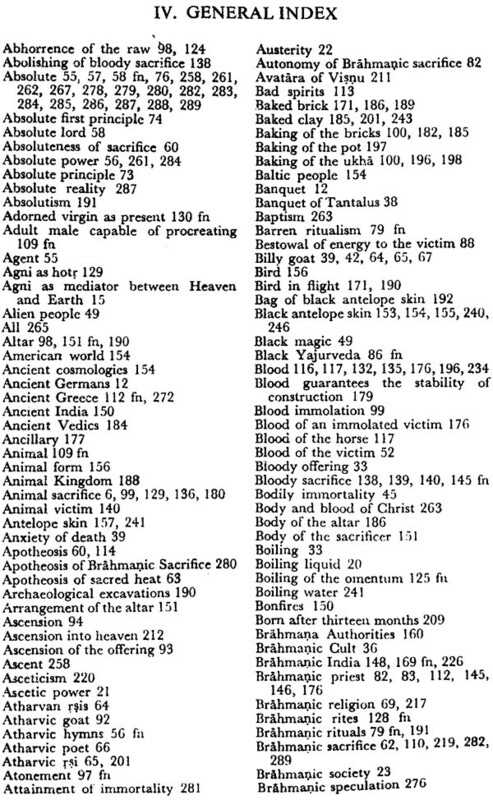 The Choice of Topic "
In many religions where sacrifice is offered, the cooking of victims in huge cauldrons is one of the most important and compelling features of the ritual. 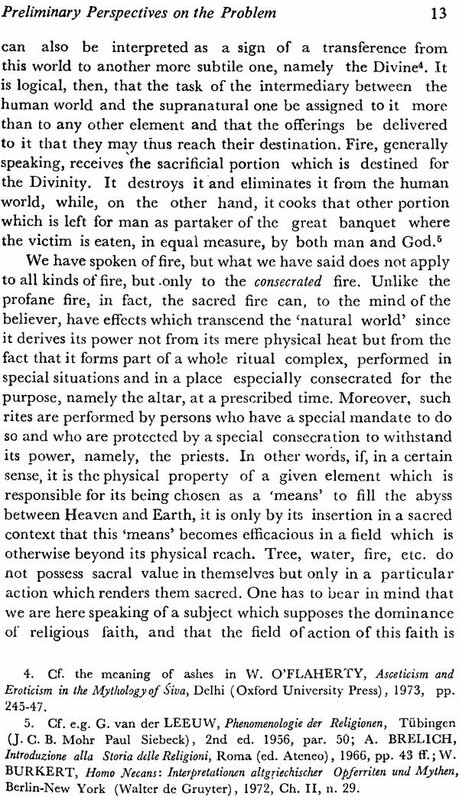 But, as one would expect, it is the sacrificial portion allotted to man which is cooked as his share in the meal with the Deity. 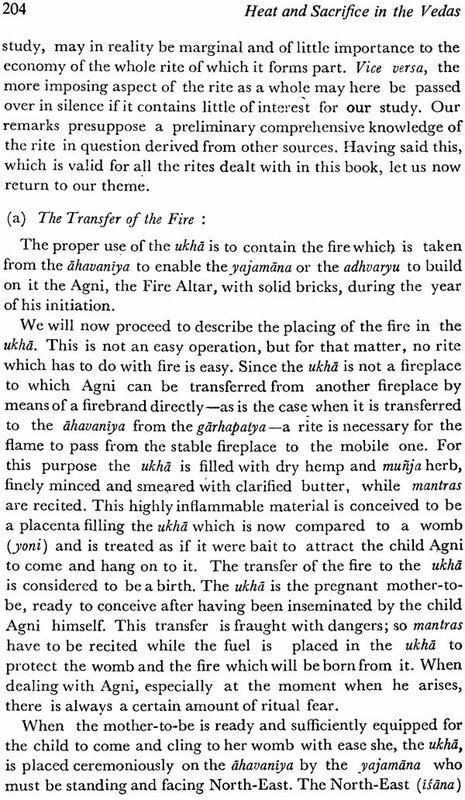 The portion allotted to the God is put on the altar fire when still raw. 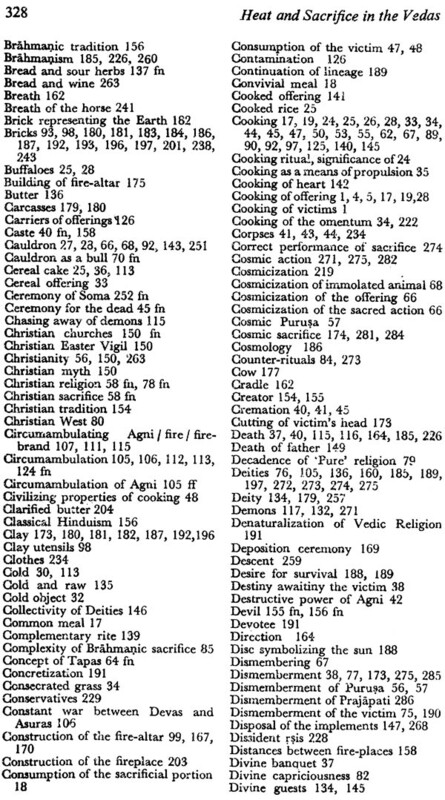 In India, however, ritual cooking is especially reserved for the portion due to the God which is destined to be burnt entirely on another sacred fire. This strange fact, hardly understandable at first sight, is what forms the topic of the present study. However, our aim is not to stop short at a mere description. 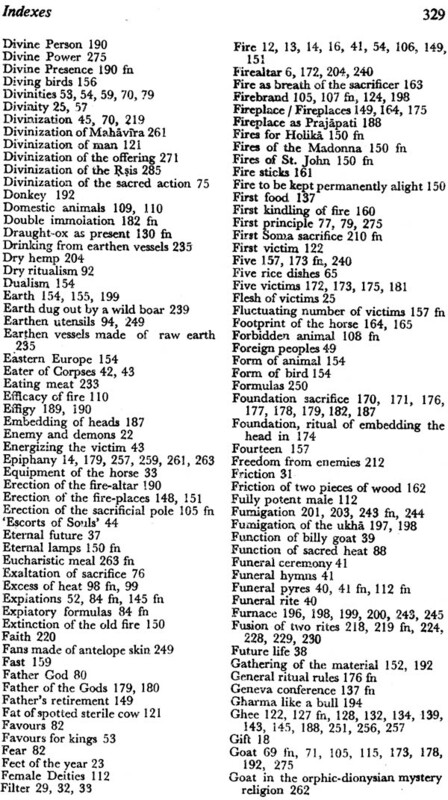 Our research into the cooking of offerings is developed bearing in mind certain philosophical, historical and hermeneutic problems whose answers go beyond the mere exposition of rites. 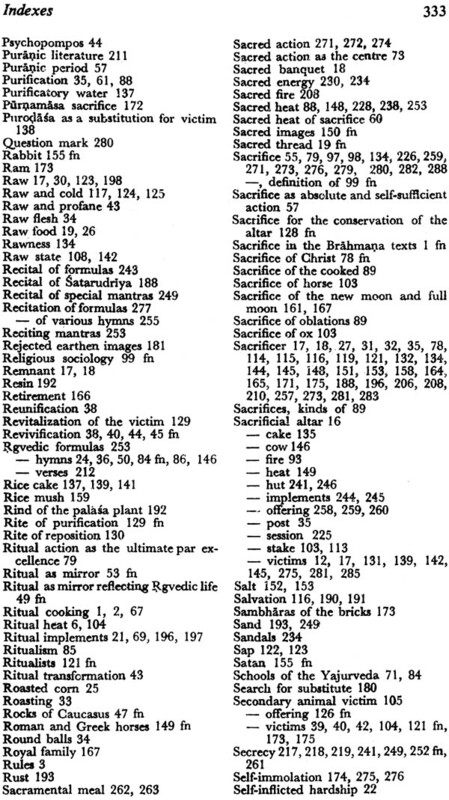 This study attempts to discover the philosophical and theologico-cosmolo- gical message which lies hidden in the necessary cooking of the victim as the most important part of the preliminaries of any sacrifice in the Vedic tradition." Research of this sort can only be done if one supposes that the rite, and especially sacrifice, is not merely the 'practical aspect', considered as complementary but subordinate to the 'more important' religious aspect of a tradition, namely the doctrinal, theological and speculative. 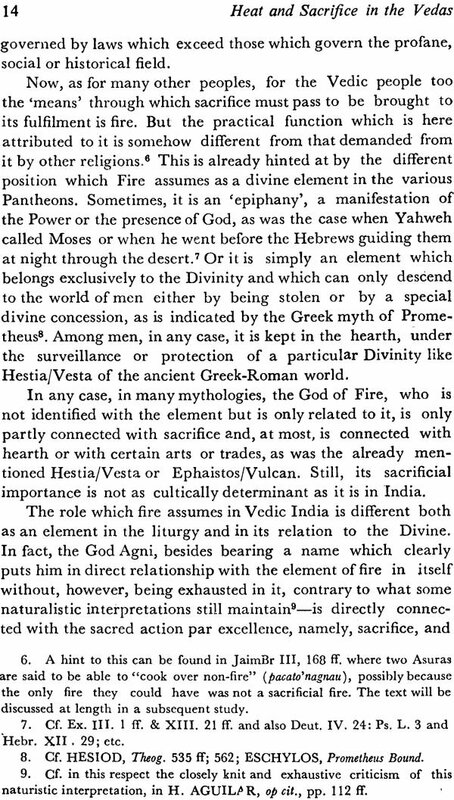 Nor that it is merely a means in the service of the Divinity, which serves, more than anything else, to characterize the Divinity by revealing its tastes and its field of action and therefore its specific physiognomy. The basis of this study is the assumption that the rite is really and truly a 'language' with its own internal message, on the same level as that of any other form of spoken expression, a message which sometimes is seen to be even independent of the doctrine which should have supported it." 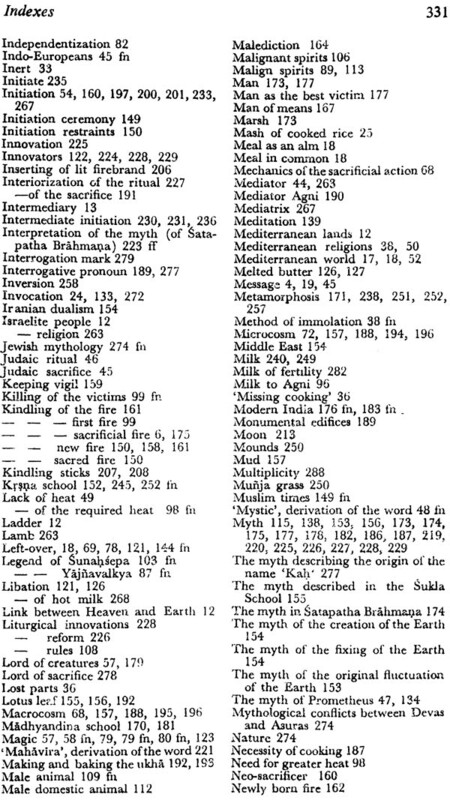 Seen in this pers- pective, an analysis of the effects of heat, and above all of ritual cooking in the rite which extends its import from Brahmanic religion to its philosophy, is but one possible example among many which show how sacrifice, in its very liturgy, rules and position it occupies in the bosom of its own tradition, can have, and does have, an active role to play also in the theo- retical field, and has a 'word' to say in the formation of the cosmological and theological vision of its culture. 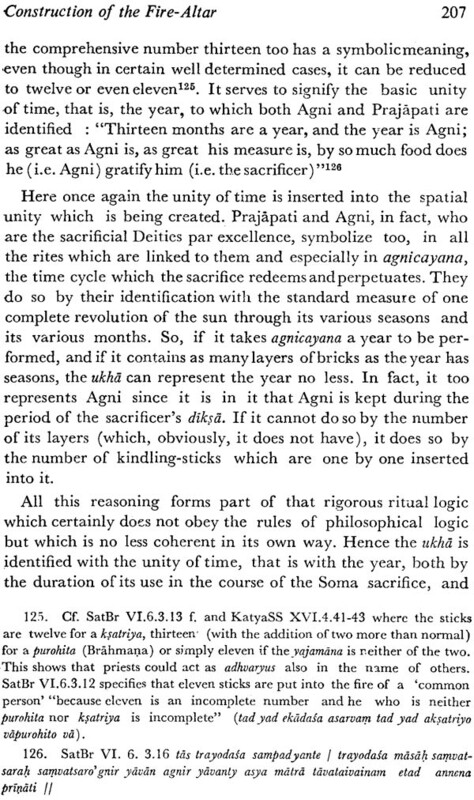 This understanding of the rite as ‘language’ allows us to approach sacrifice as having a ‘structure’ which is common to all the various religions of the worlds-without, however, having for that reason to postulate the certainly inadmissible existence of one basic Sacrifice of which all other concrete sacrifices are but surface phenomena. 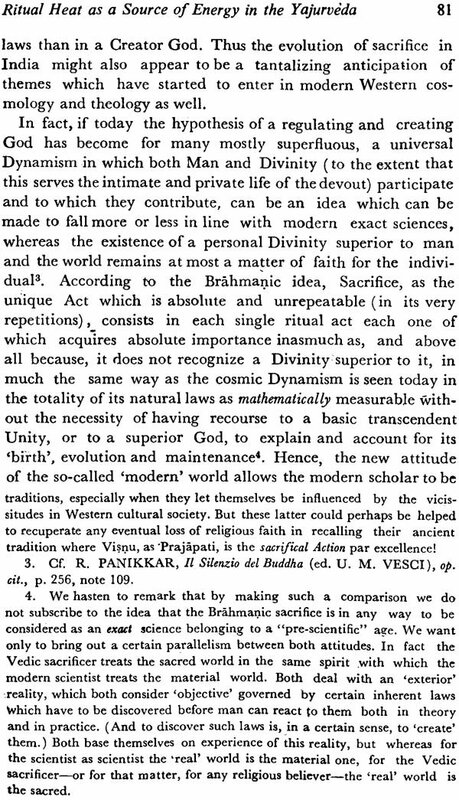 From this 'structure' certain 'syntactic' rules can be drawn which are sufficiently well defined, valid in themselves and obedient to certain laws which cannot be transgressed and which the various religious traditions have always to bear in mind in their particular practices-. The same could be said, for example, of music where rules of harmony and melody which govern the relations between notes, their intervals, their assonances and dissonances, while being of the greatest variety, are fixed and valid for every kind of melody, rhythm and sonorous composition on any musical system what- soever. This of course does not mean that these rules cannot, on occasion, be broken; still such transgression has to be internally motivated and justified, otherwise the result would be merely meaningless dissonances. 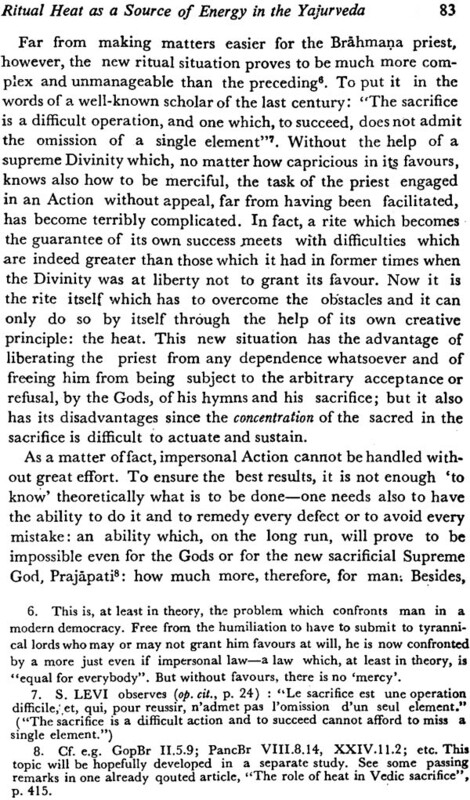 It is precisely the same with the governing religious phenomena, particularly those concerning sacrifice. 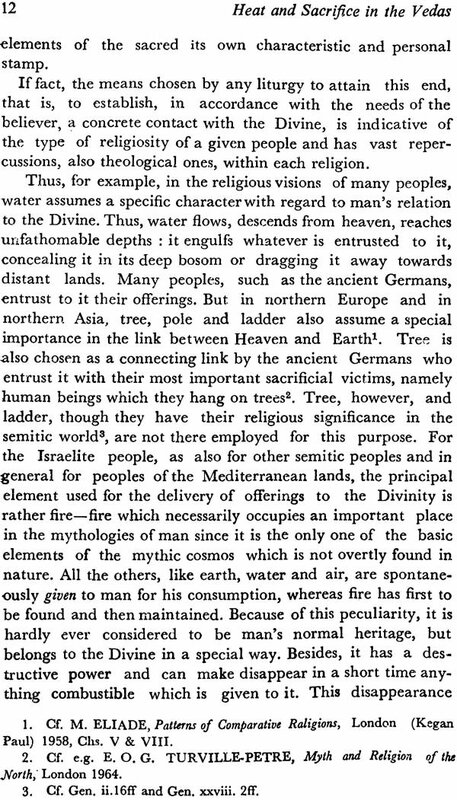 The various religions of the world employ in a manner most appropriate within the frame-work of their respective culture, certain structural rules inherent in the rite whose universality became evident only recently through scholarly compartive studies. 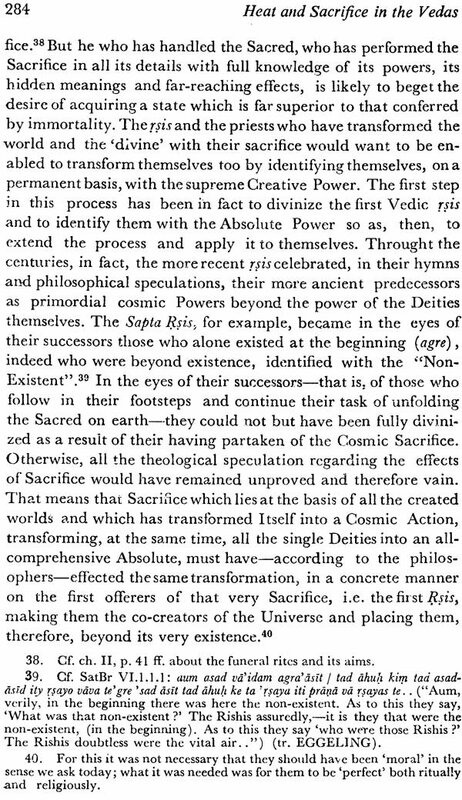 All the religions of the world have found themselves obliged to offer an internal solution, in as satisfactory a way as possible, whenever the particular 'scheme' of their respective sacrifice was at variance with the general rules. If necessity at times demanded that it was the general rules which had to be broken, this had to be done in a careful way, as is the case with certain dissonances required by some musical contexts." 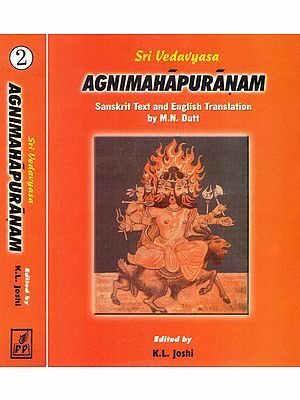 With the intention, therefore, of bringing out these 'general’ rules in full relief and at the same time of showing their adapt- ation to the 'particular' exigencies of a given religious context, we have chosen to concentrate our attention on the rite mentio- ned above and to study it in its scriptural framework provided by the Vedas, first of all trying to discover it in the collection of the Hymns, the Samhitas, and then proceeding to the Brahmanas and the Sutras. This aspect of the Vedic rite seemed to us, in fact, to be a determining factor in representing, and in its turn, in shaping, a characteristic of the religion under discussion. 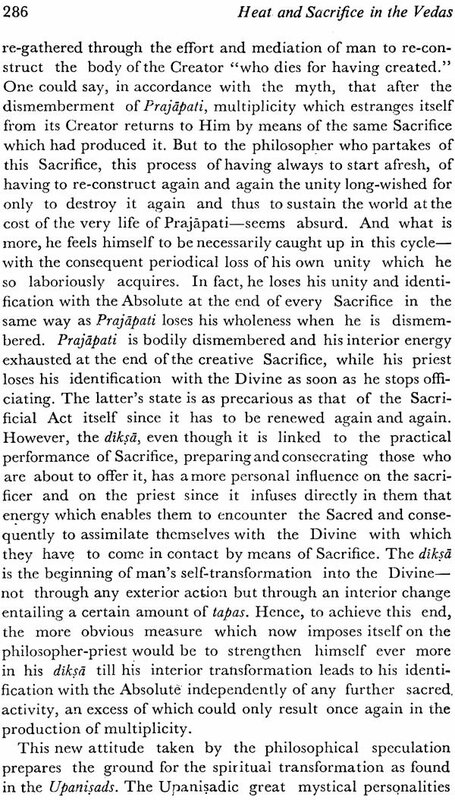 various religions there is often an action, generally to do with the It has been noticed, in fact, how in the sacrificial liturgy of offering. which seems to keep recurring and to point in which direction the importance of the• offering .itself lies. Moreover, in such action there seems to reside the 'message' which the cult of a given religion wants to transmit, in such a way that if, on the one hand, such an action determines the sacrifice in question, on the other hand, it reflects the entire religious mentality in which sacrifice is inserted. This liturgical action varies from one religious tradition to another. 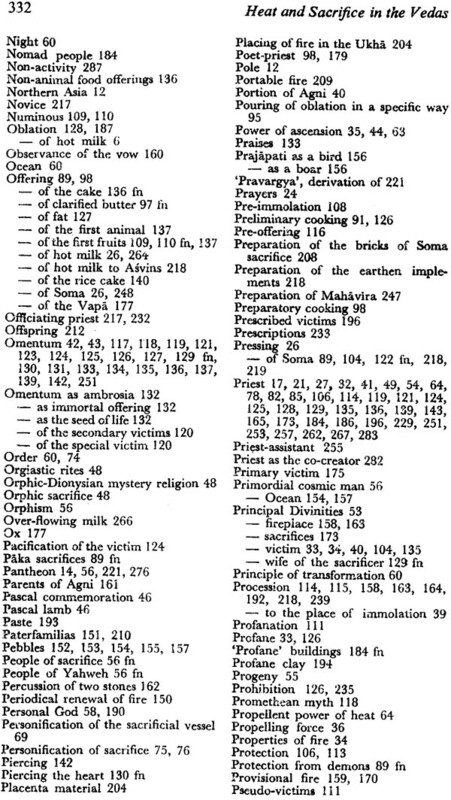 In the Vedic religious tradition the determining and revealing action seems to consist in the cooking of offerings and, in general, in the heating of sacrificial implements, while elsewhere, for example in the semitic religious tradition, it seems to consist more in the gathering of the blood or in the way the victim has to be consumed during the ritual banquet.